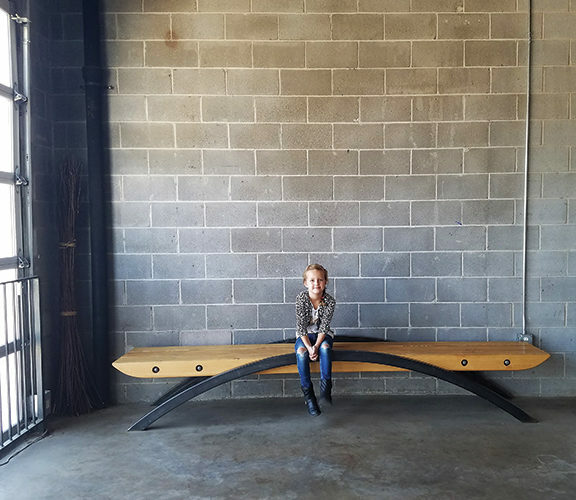 Where Wood Meets Steel, has established itself as the destination for sourcing high-end, custom designed furniture and distinctive urban wood slabs and lumber. Their well-crafted, functional works of art are deigned and built to last a lifetime. We had the privilege to meet the creative minds behind WWMS, Marina Chotzinoff and Ryan Dirksen. Let’s start at the beginning. What inspired Where Wood Meets Steel? Among the many Denver sounds of summer is the ever present chainsaw…either pruning or taking down the old growth hardwood trees that make up Denver’s shady canopy. Ryan started hunting down that sound on foot or bike and started “collecting” the trunks in our capitol hill backyard. He bought a small trailer we dubbed “li’l Ricky.” I was working in Boulder at the time and would come home to either a 10’+ tree trunk in front of the house, or, many days later, that same tree now cut into slabs. Finding people to mill the trees was challenging, and there were no available kilns nearby but he found ways to get it done. Often we would pay friends in tacos and beer to help move these heavy slabs off the trailer and into stickered piles in our backyard. One particularly large elm required three day laborers just to move a single slab. They weren’t at all happy with that job, nor were our employees many years later when we once again moved them into our shop. Ryan had learned how to weld while working at a motorcycle shop in San Francisco where we lived before moving back to my home town of Denver. He bought a welder, transformed the carriage house into a bit of a shop and started taking on jobs designing and building custom pieces. 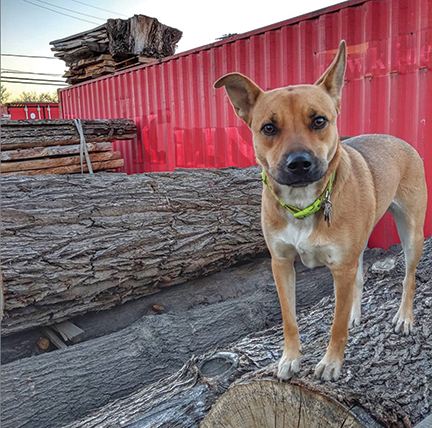 Our wood piles grew, jobs got bigger and we finally rented a real shop in RiNo in 2007. And in 2011 we bought our current shop in Globeville. I have to admit that it took me a bit to appreciate Ryan’s motivation and vision. I had helped with web design, marketing and business setup from the beginning, but each time I came home to another tree or had to help load or unload reclaimed beams and wood slabs, I questioned why we needed it all. There was even a growing pile of firewood we couldn’t use because of the “amazing grain” of each piece. Now, 13 years later, our ten year old daughter is setting aside her own wood that is too cool to burn and I’m sneaking remnants from the pile for my necklaces. How do you find your trees? We have relationships with different tree companies who know what we are looking for not only in the tree itself, but in the way it is cut. By us taking the wood, they are saved the trouble and cost of having to chip and discard it. Often times home owners will contact us directly and we will help connect them to a tree service. While we don’t quite have room to store trees for customers until it is ready to use, we have turned some customers’ trees into furniture for their homes and businesses which is pretty satisfying. Your designs are fascinating in that they are rustic and sleek at the same time. Can you explain your artistic process? There have been so many trends involving live edge slabs that we avoid. Our goal is to really create a beautiful and functional piece that lasts for years – both materially and in style. Our clients include home owners, designers, architects, home builders, furniture makers and businesses. Sometimes they have complete drawings and designs that we fabricate, but more often than not, we design a custom piece for them. With 13 years under our belts, we now have quite a portfolio to refer to, but always consider the space, function, purpose, materials and aesthetic of each piece. Customers can come to our showroom and see our inventory to pick the perfect piece. We then work with them to come up with a design they are happy with. When we are really lucky, we get a client who just loves what we do and trusts us to do exactly what we want. This means letting the wood dictate and inspire the design. As a Denver native what is your take on how our city embraces makers and creatives? We came back to Denver in 2002 to look after my dad who was in bad health and, honestly, assumed we’d return to San Francisco after a couple years. Having grown up in Denver and seeing a real lack in support for the arts or a good variety of food options, I was not keen on staying. But Denver was really getting exciting at that time and I think we have had opportunities here that we would never have had in SF. There seems to be a real collaborative spirit which has connected us with some truly great and talented people. We do work for other local designers and makers and often enlist the help of local fabricators for our own projects. That said, it is definitely becoming challenging for artists and small businesses to exist in a city with skyrocketing rents, home prices and work space. What are some of your favorite completed projects and where can we see your work? As a custom shop, a lot of our favorite work is in private homes. The key factors for us are in working with wood with truly special grain and figuring and having clients who understand and appreciate the level of quality, amount of time and care we put into each piece. Among the local businesses we have done work for are the Children’s Museum, The Source, Grand Salon, Coors and Elway’s at the Ritz Carlton. We love your studio in Globeville and your Koko mural is very fitting. How do you see your studio evolving in the future? We love our Koko mural, too! When I saw her wheat-pasting her trees at the 2016 Crush I knew we would hire her to do our shop. 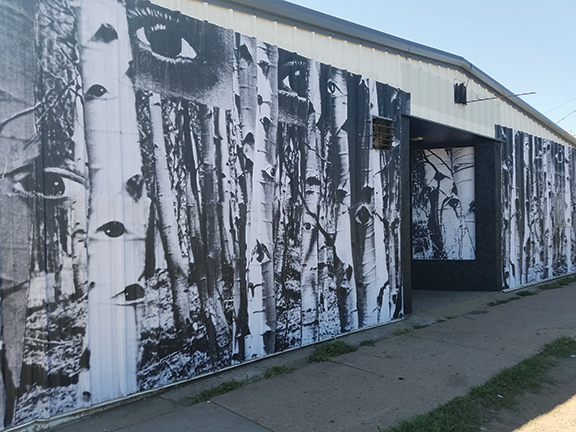 I also still love the murals on our garage bays that were painted by Birdseed Collective’s Anthony Garcia and Tom Bond as part of an Arts and Venues grant. And, if you look closely around the building, you’ll discover some enchanting little scenes created by our good friends Meredith Feniak and Risa Friedman of We Were Wild. I love surrounding ourselves with our friends’ work and definitely plan to add to our collection. Meanwhile, we have been in the torturous process of trying to expand our property next door in order to dry our own slabs. This will enable us to finally turn the piles of trees we have into usable material and continue to grow our business. We could have easily filled every single page of this issue with the gorgeous designs of Where Wood Meets Steel. However, if you want to see more custom work from this Denver couple, please visit them at www.wwms.net. 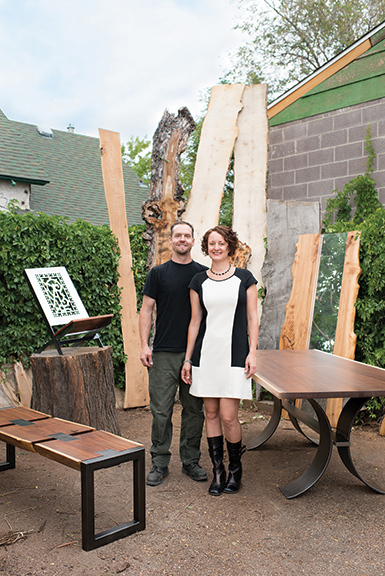 Or you can book an appointment to visit their showroom and studio located just North of downtown in Globeville. Give them a shout at 720-318-6521. Thank you, Marina and Ryan, for giving us a peek into your prolific journey.